Pipes of all raw material bases can have an appropriate place in the engineering scheme of designing longer lasting, more serviceable pipe systems if correctly subjected to Life-Cycle Cost Analysis for a particular project site. Corrugated HDPE pipe systems will last through the depreciation of a project built where there are corrosive soils and waters, or abrasive sediment flows. 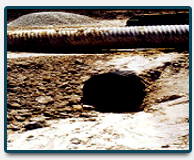 Concrete and Metal pipes have been known not to last as long in aggressive environments as HDPE plastic pipe. Therefore a growing number of engineers are recommending that these worn-out drainage systems be replaced with HDPE corrugated plastic drainage pipe. 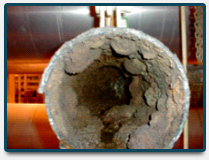 According to the Federal Highway Administration, utilities spend $36 billion annually on corrosion protection of pipes. Is your municipality contributing to these expenditures? If the answer is yes, then specify HDPE pipe. It does not corrode or tuberculate, long life-cycle reduces your maintenance budget, and infiltration into the pipe and exfiltration into the environment is non-existent. The design service life of corrugated high density polyethylene (HDPE) drainage pipe has been a subject of considerable research over the past several years. While significant long-term performance data is available for smooth-walled polyethylene pipe, the data for corrugated drainage pipes has been somewhat limited until now. 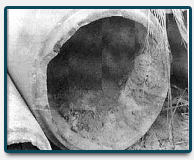 The long-term results shown in the corrugated pipe service life ad are based on the utilization of some of the current widely-accepted methods employed by the plastic pipe industry, while modifying them somewhat to take into account the unique geometry and installation conditions of buried corrugated pipe. The process for long-term service life prediction is two-fold: First, the anticipated service conditions of the drainage pipe must be assessed, including such factors as environmental conditions, soil and traffic loads, and the resulting long-term stresses and strains evident in the pipe. Second, the capacity of the material and the manufactured pipe product must be assessed. 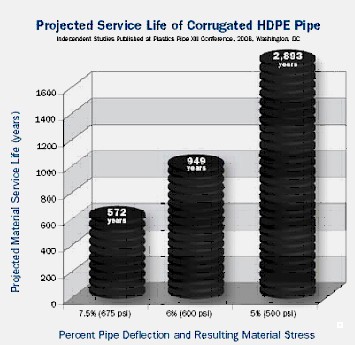 Taking into account the service loads on the pipe and capacity of the HDPE material given its known mechanisms of failure, the latest research suggests the service life of corrugated HDPE pipe is well in excess of 100 years, even at deflections greater than 5%.